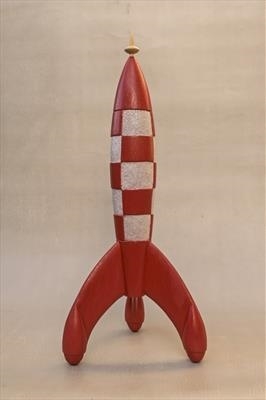 An accurate recreation of Tin-Tin's Moon Rocket made for a Tin-Tin enthusiast. Commissioned by his wife for their fifth wedding anniversary. Five years ago I was commissioned by the same person to make something for her future husband as gift on their wedding day. This was a large recreation of La Fetiche Arumbaya form another Tin-Tin story. Thus five years later I made this recreation of Tin-Tin's Moon Rocket for their fifth wedding anniversary.